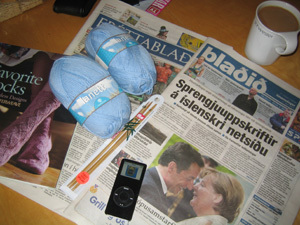 Yarn, needles, coffee, ipod - check. Pattern yet to be decided! Helpfully, the weather looks like there is nothing better to do than snuggle up under a blanket and knit. Cuff and first pattern repeat done, pattern Embossed Leaves. Hmm... I have no idea if I can make it yet. 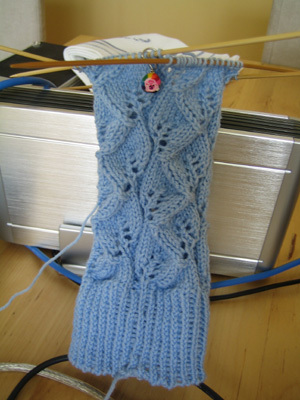 In case anyone is wondering why I knit them in baby blue - it might be known here and there that I cannot stand wearing blue (except for jeans). 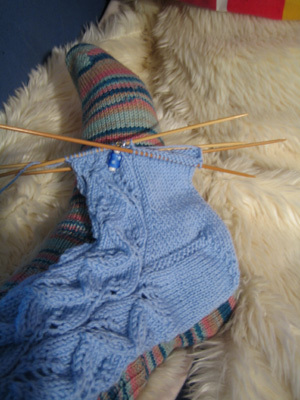 The plan is to cheat a little on this knit a sock in a day challenge by knitting socks for a friend. Two shoe sizes smaller than my own feet, hehe. Leg finished, time to start the heel! Only the unexpected, foul play or an injury can stop me now! Unwashed, unblocked and blurry. Wow. To sum up, there were days in my life sure more worthwhile than today. On the other hand, I've seen worse. So, tomorrow the second? I don't think so - but I will cast on. Stats: 39 g (or 152 m) of SandnessGarn Lanett, colour 4904. 5 bamboo needles, 2 stitchmarkers,1 tapestry needle, 1 pattern with absolutely no changes neccessary, exept not cutting the yarn at the heel. by Carola at 8:11 f.h. Good luck finishing your sock in a day! maí 17, 2007 10:33 f.h. One day--CAN SHE MAKE IT? I'll keep my fingers crossed for you! maí 17, 2007 1:22 e.h.
maí 17, 2007 2:19 e.h.
maí 17, 2007 2:43 e.h.
maí 17, 2007 5:00 e.h.
maí 17, 2007 8:43 e.h.
You are amazing!!!! And look, one of MY markers on your one day sock! You know..... I happened to lose your address when my computer hard drive crashed. Would you lease send it to me again? maí 17, 2007 9:29 e.h. SO impressed! When I read your plans yesterday, I was skeptical, but you've made a believer out of me. I love the way you chronicled your progress. And the pattern is fabulous. Now, are there similar plans for its mate? maí 18, 2007 1:07 f.h. That is so amazing! Congratulations! I love working with Lanett yarn, and it works wonderfully with that pattern. maí 18, 2007 10:53 f.h. maí 18, 2007 7:13 e.h.
maí 22, 2007 3:03 f.h. Wow! That's just about all I can say--wow! Beautiful and in one day! maí 23, 2007 12:36 f.h. Please send me your full name and adress, and the prize will be on it's way. maí 25, 2007 9:12 f.h. 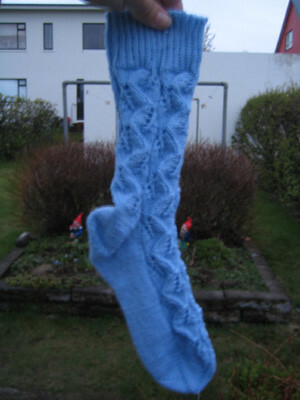 This is a bit eerie...I have close and dear friends in Iceland (I live in Denmark) and the house one can see in the background of the finished and beautiful sock looks so much like theirs that it is really weird (although I know many Icelandic houses look like that)!? Do you by chance live in Kopavogur? júní 02, 2007 7:52 e.h.